Food for Action: Community-Based Research Scholars Help LAYC and Seek Answers | American University Washington D.C.
You are here: American University Communications & Marketing News Food for Action: Community-Based Research Scholars Help LAYC and Seek Answers | American University Washington D.C.
Community-Based Research Scholars presented their research findings to the Latin American Youth Center. Photo credit: Amanda Harrison, manager of Undergraduate Scholars Programs. Jane Palmer's community-based research course is an innovative endeavor. It enables American University students to engage with the Washington, DC, community, while nonprofits benefit from AU students' assistance and research findings. So much quality scholarship is produced in higher education, but this partnership ensures that the data collected ends up in the hands of community-building organizations. The class is part of the Community-Based Research Scholars (CBRS) program, which is a selective, first-year living-learning community program directed by Palmer. In 2016-2017, students focused on homelessness. This year they shifted their energies to another social problem affecting DC: food insecurity. "I'm trying to teach the students about food access and food insecurity," says Palmer, a professorial lecturer in the School of Public Affairs. "But the concrete project is also about what students are getting out of this class at a micro level." That granular work teaches first-year undergrads how to devise and conduct research in a way that will ultimately be useful to AU's home city. During the fall of 2018, Community-Based Research Scholars learned about food access issues, such as the lack of grocery stores in DC's Ward 7 and Ward 8. They also got background in research methods and data collection. There's another class section that's more policy-oriented, taught by School of International Service assistant professor Garrett Graddy-Lovelace. 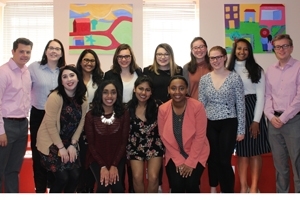 In the spring semester, Palmer's class partnered with the Latin American Youth Center (LAYC) and its DC Teen Center, along with the affiliate Career Academy and YouthBuild Public Charter School. The class broke into groups and fanned out to those three locations, where they met with young DC residents. Through both focus and survey groups, AU students got a clearer picture of food insecurity. They work in conjunction with culinary classes taught by Julia Kann, LAYC's program manager for food and nutrition. To promote healthier lifestyles, Kann teaches these same DC residents-often from immigrant families, roughly 14-24 in age-about nutrition, following recipes, and preparing meals. "When I went to the Teen Center, it was predominately Ethiopian teenagers, and they were learning to make a traditional Ethiopian dish," says Palmer. "So it was really fun. My students were cutting onions with them, but then they were all crying. They bonded over that. They cooked together and then my students sat down and interviewed them about their experiences in the class." AU students later presented their survey/focus group results to Kann and other staffers at LAYC. One of the key findings-despite that day making Ethiopian food-is that DC kids want more food options tied to their cultural heritage. "I mistakenly came in with the assumption that they were learning that at home. Of course, many of them are not cooking at home, or don't have someone to teach them to cook at home," says Kann, who found AU's research results quite helpful. "Now, as I think about what I'm writing into the curriculum, I'm trying to learn from what the young people said in those focus groups and surveys." Kefai Debebe, an AU Community-Based Research Scholar and political science major, says she enjoyed her interactions with the DC residents. Before the focus groups started, she accompanied program participants on a volunteer field trip to a grocery store. "I was helping some students find the fresh food items in the grocery store near their school, and it was really nice," Debebe says. She recounts how a cultural connection helped break the ice. Debebe grew up in the US, but she was born in Ethiopia. And she noticed a language barrier with one of the participants. "I started speaking to her in Amharic, and kind of getting to know her much better. And I saw her become instantly more comfortable knowing that I was also Ethiopian," she says. "The AU students were lovely to deal with-very professional, very kind, very generous with their time," Kann says. "And I know that the young people here really enjoyed getting to know the AU students." DC participants valued Kann's instruction, and they told AU students they'd welcome even more cooking classes. "For some students, the class period ran into lunch time and that's when they'd eat. So they talked about how one more class date would mean one more guaranteed meal," says Debebe. Despite this sentiment, it was difficult to maintain better dietary habits outside of the classroom. "The things that hindered them were issues of convenience and availability. Being able to take the time to cook for every meal is a challenge," Debebe explains. Grocery stores can be quite a distance from their homes and are not necessarily Metro accessible. Full meals require more ingredients, which can be difficult to transport. "Just going to the grocery store and carrying all those groceries to their houses was another issue that was brought up," she adds. "This was Columbia Heights, so it's a very urban environment with a lot of fast food restaurants around them. On their way home, it was just easier to eat that way. And their parents may not be able to cook a full dinner," says Erica Cirineo, a CBRS public relations major/ education studies minor. "They had the skills, because when we asked them what they've learned, they demonstrated it. But it was just not having the resources and the ability to get there and get the right foods." Palmer notes that even when participants tried to eat healthier, it was tough to maintain consistency. "Some of them said that after they learned about the sugar content or sodium content in Chick-fil-A, they stopped eating it. But then they went back because of convenience," she says. AU students took other excursions to understand food insecurity. They visited the farm at Airlie, which donates to food banks and pantries. The class also worked with Capital Area Food Bank, giving out emergency groceries to families at a pop-up farmer's market. "There were about 250 people there on a cold Saturday morning," Palmer recalls, "so that was really impactful for the students." Students touted the CBRS living-learning community experience. "I'm really, really happy with the types of issues that we're working on, and actually getting out into the community and not just staying on campus," says Cirineo. And with this class, she adds, "I really liked interacting with these people and getting information out of them, knowing that it's going to, in some way, benefit them." Upon reading about CBRS during the application process, Debebe felt it lined up perfectly with her career goals. "It's an amazing opportunity to be able to learn about research, and to apply the things that we're learning in class directly into the community. And have it actually leave an impact on the community. To me, that's the whole reason why I chose to come to AU." *Pictured above: AU student Kefai Debebe.